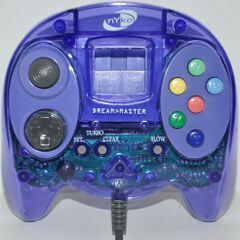 The Dream Master by Nyko is a third-party controller for the Sega Dreamcast. It is a confusing controller in terms of origin - Innovation also sold these controllers as the Color Controller, both being sold in North America possibly simultaneously. A lack of documentation means we do not know who its true creators are, although Nyko's variants appear to be more common. The Dream Master is a programmable controller, with basic turbo features and added and buttons acting as alternatives for the and triggers.